This contributor needed an attachable guitar amplifier. So he made one -- and raised $60,000 in his first two days. Starting a hardware business is tough. There are many barriers to entry, not the least of which is financial. But through creative deal-making and industrious problem-solving, I was able to take $12,000 in savings and turn my company JamStack into a $1.4-million-dollar business in under 12 months. 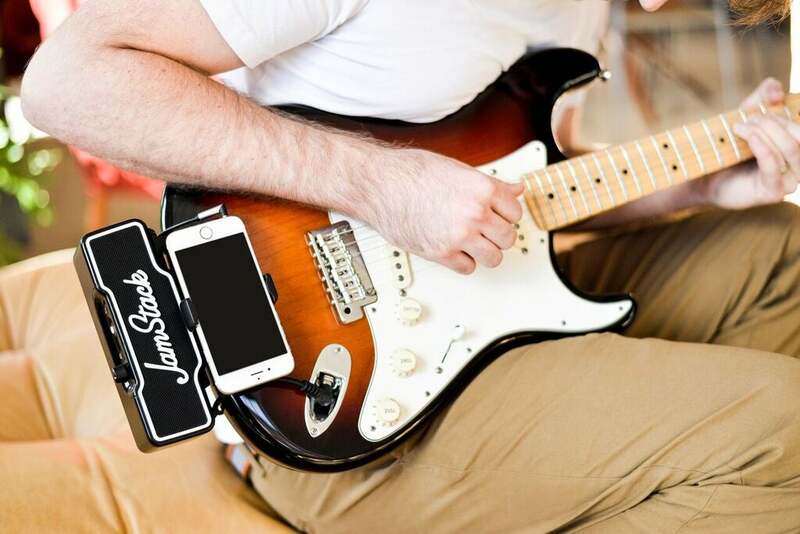 My aim: to produce the first attachable guitar amplifier that connects to a smartphone, and then to get people to buy it. Here are the steps I used to ensure JamStack became a successful business in the most efficient way possible. I'm an engineer, tinkerer, and inventor; I'm also an electric guitar player. And in the latter context, I felt the need to alleviate the annoyances I was experiencing. Specifically: It took too long to set up my equipment; my amps sounded terrible at lower volumes; they could not handle backing tracks; and nothing was portable or ergonomic. I remember thinking, I wish all this equipment was already on my guitar. There were several epiphanies which led to the final JamStack design. The biggest was the realization that Bluetooth speaker technology and modern smart phones were now at a place where they could facilitate a superior guitar-playing experience. The first iteration was actually a custom-built guitar, complete with 3D printed phone mount and numerous holes for the speaker components. It became my favorite way to play guitar, and I knew I had something, but at the time I was a full-time teacher and didn’t know much about business or bringing a physical product into reality. Fast-forward a few years: I noticed someone had created an ultra-premium version of my guitar and raised almost half a million dollars on Indiegogo. I was simultaneously validated and frustrated that I had lost out on an opportunity, though I felt there was still a spark of opportunity there. So, I ordered speakers, phone mounts and parts from the hardware store and began working on my own proof of concept. I wanted to prove to myself that I could make something that was fun and easy to use regardless of how it looked. I began seeking advice and started touring the innovation hubs in my hometown of Toronto until someone directed me toward the industrial design firm Cortex Design. I was told that its professionals had a great nose for sniffing out great ideas and that they do amazing work. Paying talented people to design a product for you is expensive, but if you have strategic partnerships behind you, sometimes the right people are willing to give you a chance. I was able to structure a deal where I paid Cortex Design enough to cover its costs in exchange for a return on a crowdfunding endeavor. The deal was also contingent on my landing a successful and credible crowdfunding manager as well as a talented videographer. I approached my good friend Dan Slater for video production work and he agreed to do a $10,000 video but also to wait for his money until after the crowdfunding process. Next, I pitched my product to a highly respected crowdfunding manager, Khierstyn Ross, and won her over with my plan. I was extremely fortunate to obtain these three partnerships. I think that if you have a great idea you can really defend, and emanate fiery confidence, people will believe in you. By this stage, my life was getting increasingly complex. I was working as a full-time teacher and running a business after hours and things became overwhelming at times. Without tools like Calendly for scheduling, Asana for team task management, Active Campaign for email services and Slack for team communication, things would have fallen apart. I highly recommend these tools if you are embarking on a similar endeavor, as they assist in organization and time management. As my business progressed, I needed more money. There were going to be costs associated with running the campaign and the need for ads, retainers for personnel to help with social media, publicists and photoshoots and more. Now that I had firm business concept, and some momentum, I proceeded to write a business plan for Futurpreneur (a Canadian nonprofit that supports startups) and the Business Development Bank of Canada, and was given a loan for $45,000 ($Canadian) to get me to the next phase. Through subsequent months of planning and hard work, I have raised to date over $250,000 ($Canadian) in crowdfunding. I have also participated in numerous interviews on popular television shows such as Dragon’s Den and High Tech Toys and local news shows here in Toronto. These helped spark the interest of several investors and spread the word. Given the $1.4 million valuation I was given by those investors and my 1,500 pre-orders (to date), I am now well on my way toward manufacturing and beconing a debt-free multi-million dollar company with design and tooling already paid for. Do not get distracted by the finer details you have not yet sorted out; you will solve those problems when the time comes. Momentum and money have a way of making problems go away. You are going to get to a point where you need money, and debt can only get you so far. You need to be extremely industrious with all of your resources, to structure deals carefully to reward success and to make sure every dollar you spend is getting you closer to investment. Step 1: Do everything you can to make certain your idea is both possible and very compelling. Show your proof of concept to people who have no problem being harsh. A slight improvement isn’t good enough, it needs to be five-to-10 times better than the current solution. Step 2: Find a strategic partner to start building your first minimum viable product, prototype or demo. Step 3: Secure some seed financing (through loans -- such as I did with Futurpreneur and the BDC, or through savings and family) to make your prototype compelling and exciting. Step 4: Heavily validate the idea any way you can through, for example, letters of intent, testimonials, crowdfunding or pre-orders. Step 5: Raise money to get your product into the market.